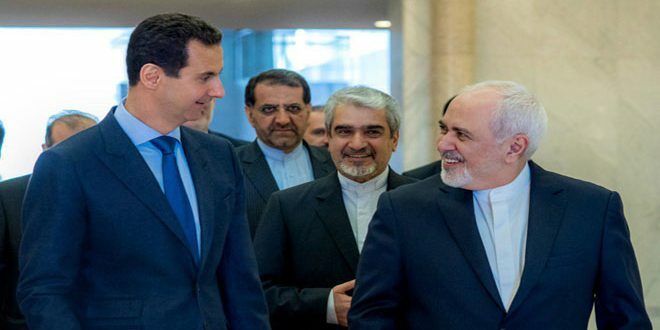 Syria’s leader Bashar al-Assad has hosted Iranian Foreign Minister Mohammad Javad Zarif in Damascus. Official statements gave no details of a discussion about Syria’s eight-year conflict, declaring “the agreements between the two sides, joint projects, their stages of implementation, and the difficulties facing them, as well as expanding cooperation in the future”. Last week the Trump Administration designated the Revolutionary Guards a “foreign terrorist organization”. It was the first time that the US Government has labelled an entity of a foreign government as terrorist, in a decision which American officials say affects 11 million people connected with the Guards. According to the official accounts, Zarif criticized the Trump Administration’s recognition of Israeli sovereignty over the Golan Heights, occupied since the 1967 Arab-Israeli War. He asserted that the recognition, sanctions on the Guards, and the US de facto endorsement of Israeli sovereignty over Jerusalem “attests to the failure of Washington’s policy in the Middle East and the American administration’s incapability”. In recent years, the Revolutionary Guards have been the leading Iranian actor inside Syria, with their essential military support of the Assad regime and their economic projects. Zarif and the Foreign Ministry have been pushed to the side. However, Zarif is scheduled to meet on April 25-26 with Russia and Turkey, the other two countries in the Astana process of political discussions. The three countries will convene in the Kazakhstan capital, amid a de facto partition of Syria into three areas: those under regime control, the Kurdish territory in the north and northwest, and the opposition provinces in the northwest. In further preparation, Zarif is in Ankara today for discussions with counterpart Mevlüt Çavuşoğlu. Recent meetings between regime and Iranian officials have also focused on reconstruction, with Syria’s GDP down 75% during the conflict and more than $400 billion in damage. But Iran, with its own economic problems amid comprehensive US sanctions, is limited in its ability to put more billions into the regime, and Tehran’s attention has been on its construction projects, with the displacement of Syrians, and control of resources. In the official accounts, Zarif spoke of “the constant talks related to economic cooperation between Syria and Iran”, with “positive discussions have been recently held with regards to transportation lines between Iran, Iraq, and Syria”. Syrian State news agency SANA said Zarif also met Prime Minister Imad Khamis to discuss the economy, investment, tourism, culture, and infrastructure and “the importance of constant coordination…in light of the unjust western sanctions imposed on the Syrian and Iranian peoples”.